Heading to the Northeast Florida/Southeast Georgia area? Debbie Jones, Community Relations Administrator at Jacksonville International Airport (known as JAX on your flight itinerary), assures us, "Our airport offers customers a variety of shopping and dining options, free Wi-Fi, convenient charging stations in seating areas throughout the terminal, nationally recognized permanent and rotating art exhibits and live music every day." Live music? Wow! She has me wishing I had a reason to fly to Jacksonville. 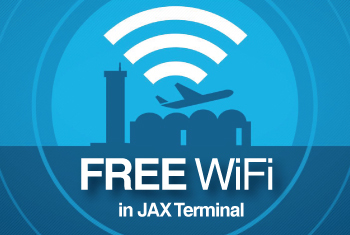 JAX is part of the larger Jacksonville Airport System, owned and managed by the Jacksonville Aviation Authority, which also includes Jacksonville Executive at Craig Airport (CRG), Herlong Recreational Airport (HEG) and Cecil Airport (VQQ). Jones explains that the airport system locations are "strategically located throughout the Community". Jacksonville accommodates a mix of business and leisure travelers all year, which means, Jones says, "we don't experience huge seasonal swings in passenger traffic". This continual flow of travelers has both legacy carriers we all know and smaller, low-cost carriers flying in and out of JAX, giving passengers a range of itinerary options when planning their next trip. In 2011, New York Times Magazine named JAX as one of the cheapest airports to fly out of in the United States, speculating that the low cost of fares was a draw to tourists. Plus, the long-term parking options start at a very inexpensive $5 a day. If you fly often, not only do you get frequent flyer miles, but you can join the airport's Frequent Parker Rewards Program for extra perks. Aside from price, the airport is known for its safety standards creating the national model for an in-line baggage screening system that also sorted to the various airlines. To honor this accomplishment keeping travel safer, in 2013 JAX was named Outstanding Airport Project of the Year by the Florida Department of Transportation. Safety and security, not just of the airport, but of the entire area, is important. "Our community is not only where we live, but also it's who we are," Jones emphasizes. "We're proud to be part of Jacksonville and its surrounding communities."